Takahashi, T. “The Complexity Model of Communication in the AI Age: the case of Japanese Engagement with Artificial Intelligence and Robots in Everyday Life”, Should Robots Be Our Friends? Ethical and social scientific implications of the growing emotional engagement of humans with AI agents and robots, Boston University, Boston, US, April 2019 (invited). Takahashi, T. “AI Narratives and Robotics in Japan: the Complexity Model of Communication”, The British Society for Literature and Science, Royal Holloway, University of London, London, UK, April 2019. Takahashi, T. “Human First Innovation: Balancing the Opportunities and Risks of AI”, Japan UK Technology and Humanity in Education 2019, the Royal Institution, the Embassy of Japan, UK, March 2019 (invited). Takahashi, T. “AI Narratives and social impact on Robots in Japan: beyond techno-orientalism”, Science in Public 2018 , University of Cardiff, Cardiff, UK, December 2018. Takahashi, T. “ AI Narratives and Social impacts of Robots in Japan ”, Global AI Narratives Tokyo Workshop, Waseda University, Tokyo, Japan, September 2018 (local organizer). Takahashi, T. “Robots and the Social Impact of Smart: Cross-cultural research on the future social benefits of AI/robots between the US and Japan” 26th IEEE International Symposium on Robot and Human Interactive Communication (RO-MAN)2017, Lisbon, Portugal, August 2017. Takahashi, T. “Complexity in a Time of Robots: the Social impact of AI in Japan” Care, media and ritual: Creative, design, social and ethnographic interventions Workshop, Keio University, Tokyo, Japan, July 2017 (invited). Takahashi, T. “Robots on the road to Tokyo Olympics 2020: Complexity and the Social impact of AI in Japan” AI in Asia, the Digital Asia Hub with the Berkman Klein Center for Internet & Society at Harvard University, Seoul, Korea, December 2016. Takahashi, T. “Complexity Model of Communication with Computer Images” 2016 Multimedia and Applications, London, UK, August 2016. Takahashi, T. “Preparing the Young for Japan’s Global Future: Opportunities in Digital Literacy” 2016 Preconference of the International Association for Media and Communication Research (IAMCR), ‘Children’s and Young People’s Rights in the Digital Age’, LSE, UK, July 2016. Takahashi, T. “It’s Now Cool to Share: Japanese youths and their changing relations to video sharing sites”. 2016 Preconference of the International Communication Association (ICA) Communicating with Cool Japan, Tokyo, Japan, June 2016. Takahashi, T. “Audience engagement and self-creation: young people and mobile social media in Japan, UK and US”. 2015 Conference of the International Association for Media and Communication Research (IAMCR), Montreal, Canada, July 2015. Takahashi, T. “Japanese Youths and the Opportunities and Risks of Social Media”. 2014 Conference of the International Communication Association (ICA), Communication and “The Good Life” Around the World after Two Decades of the Digital Divide, Seattle, USA, June 2014. Takahashi, T. “Audience engagement between local and global media worlds: Japanese youths and their social media”. Social Media, Transforming Audiences 4, University of Westminster, London, UK, September, 2013. Takahashi, T. “Japanese Youth and Social Media”. ［論文発表］ 2013 Conference of the International Association for Media and Communication Research (IAMCR), Dublin, Ireland, June 2013. Takahashi, T. “Japanese Youths Engaging with Mobile ICTs: Looking ahead from the Past Ten Years”. ［論文発表］ ICA 2013 Communications and Technology Division: Mobile Communications 10th Anniversary Pre-Conference Workshop, London, UK, June 2013. Children, risk and safety online: Research and policy challenges in comparative perspective, LSE, London, UK, September, 2011. Transforming Audiences 3, University of Westminster, London, UK, September, 2011. Takahashi, T. “Are Youths and their digital media the same everywhere? Connectivity in the US, UK, and Japan”. ［論文発表］2011 Conference of the International Association for Media and Communication Research (IAMCR). Istanbul, Turkey. July 2011. Takahashi, T. “Japanese Youths, Mobile Phones, and Social Media”. [パネリストとして招聘] Harvard-MIT-Yale Cyberscholar Working Group, Yale Law School. November 17th, 2010. Takahashi, T. “Towards the ‘internationalising’ of digital natives studies: a Japanese perspective”.［論文発表］2010 Conference of the International Association for Media and Communication Research (IAMCR) (国際メディアコミュニケーション学会).Braga, Portugal. July 2010 . Takahashi, T. “Mobile Phone and Everyday Life: the case of Digital Natives in Japan”. [パネリストとして招聘] Internet Research 10.0-Internet: Critical, Association of Internet Research (AoIR：国際インターネット学会), Milwaukee, WI, USA, October 2009 . Takahashi, T. “The Mode of Audience Engagement: Ethnography on Japanese Engagement with Media and ICT in the Global Age”.［論文発表］Transforming Audiences 2, University of Westminster, London, UK, September, 2009 . Takahashi, T. “Mobile Phone and Social Networking Sites: Digital Natives’ Engagement with Media in Everyday Life in Japan”.［論文発表］the Media, Communication and Humanity Conference at LSE. London. UK. 2008. Takahashi, T. “Digital Natives and Audience Engagement: Ethnography on Japanese Youths’ Engagement with Mobile Phone and SNS (social networking sites) in Everyday Life”.［論文発表］2008 Conference of the International Association for Media and Communication Research (IAMCR) (国際メディアコミュニケーション学会).Stockholm. 2008. Takahashi, T. “MySpace or Mixi? : Japanese Young People’s Engagement with Social Networking Sites in Everyday Life”.［論文発表］2008 Conference of the International Communication Association (ICA) （国際コミュニケーション学会）. Montreal. Canada. 2008. 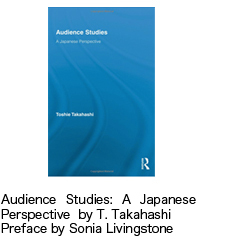 Takahashi, T. “Media Audiences, Self-creation and Everyday Life”［論文発表］Transforming Audiences, University of Westminster, pp. 55-56, 2007. 9. Takahashi, T. “Reflections on the global, the transnational and the international- A Conceptual Queste-”［セミプレナリー・セッションのパネリストとして招聘］(Session: Joint semi-plenary session with ICA, IAMCR(国際メディアコミュニケーション学会), p.32, 2007. 7. Takahashi, T. “Media, Audience Activity and Globalisation: Towards the ‘De-Westernizing’ of Media Studies from a Japanese Perspective”Global Media and Communication, 3(3). 2007年.［論文発表］(a major conference ‘Internationalising Media Studies: Imperatives and Impediments’, University of Westminster, p.131, 2006. 9). Takahashi, T. “Audience Engagement with Media and ICT”［論文発表](Session: Mass Communication, ICA（国際コミュニケーション学会）, Dresden, 2006. 6). Takahashi, T. “Media, Globalisation and Japanese Audiences”［パネリストとして招聘］(Session: The Impacts of Media Globalisation in Asia, IAMCR(国際メディアコミュニケーション学会), Taipei, Taiwan 2005. 7).